Around the World in Eighty Days is a classic adventure novel by the French writer Jules Verne, first published in 1873. In the story, Phileas Fogg of London and his newly employed French valet, Passepartout, attempt to circumnavigate the world in 80 days on a £20,000 wager set by his friends at the Reform Club. 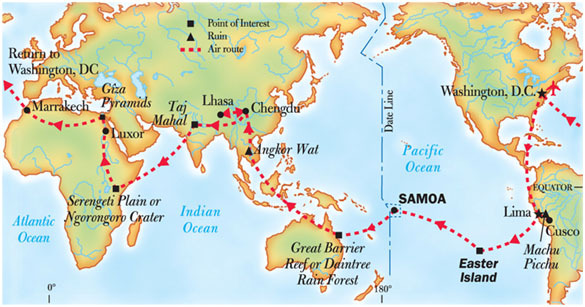 The proposed itinerary takes them by rail and steamer around the world. In the best known film version David Niven (as Phileas Fogg) and Cantiflas (as Passepartout) engage the same wager but conduct the journey by hot air balloon. Now I have to admit that, other than Washington, DC, I have not been to any of the other places but would dearly like to go. (To be more precise, as a bad traveler, I would like to have been.) However, until I win the lottery or get that inheritance from my long lost Uncle Louie, I will rely on the internet and the blogosphere to provide at least a virtual experience. Hence, eighty seconds versus eighty days. Personally, if I had the money, I think that I would select something akin to the hot air balloon for the trip rather than a private jet. 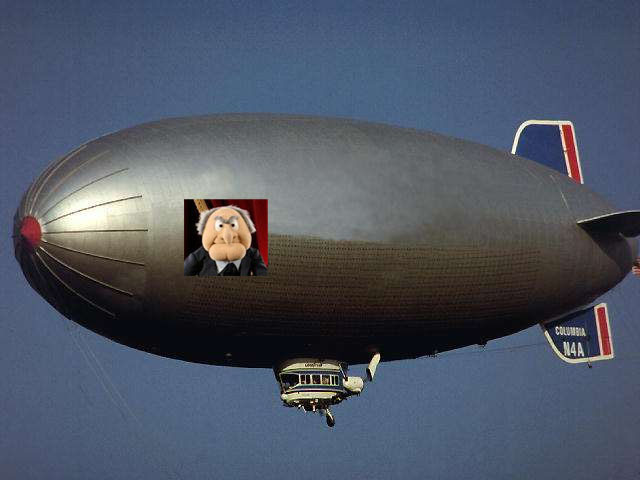 Perhaps a modern day dirigible, which I would dub The Curigible. If you got to devise your own personal around-the-world trip, where would you go and by what means would you travel? This entry was posted in Uncurmudgeonized and tagged Around the World in Eighty Days, daily life, exotic travel, Jules Verne, philosophy, thoughts, travel. Bookmark the permalink. I’ve been to the Pyramids and the Taj Mahal. While I’m glad I got to see them, and would like to see them again, I would really like to be able to enter some sort of teletransporter that whisked me there and then whisked me back home. Getting to and from both can seem to take for ages when you are forever on guard against Delhi belly and some of the other unpleasant bits of travel in those countries! Getting there is no longer half the fun. I’d start in France, go barging, driving and by train. Cross into Italy and drive through Tuscany, boat past Cinqueterre. Train up to Venicen drive through the lakes to Milan, fly to Rome. Drive to Sorrento, along the Amalfi coast, ferry to Capri, cross Bay of Naples by boat. Fly to Athens, cruise the islands. Then I just don’t know! Whew. Perhaps catch your breath? For me, the real reason for travel is to eat the food and drink the booze. Other than driving my own car across the endless, virtually empty highways of the Canadian prairies, I don’t really enjoy travel for its own sake. So my preferred method of travel would be teleportation: Decide which country I want to visit, use Google and Street View to find a nice restaurant, and pop over. Eat, drink, wander around on foot to see the sights for a few hours, and then pop back home and sleep in my own bed. Repeat as needed. No luggage, no passport, no problem. Please, please let me know when you have created or found that teleportation device. I would like to visit England. I have been meaning to finally meet my heroes, John Steed and Emma Peel. I would travel of course in a clown car, with 88 other clowns in the back seat, listening to Bette Midler. John Steed wore bowler hats and drove vintage automobiles so the clown car should be a lvintage British auto and the 88 other clowns should all wear bowlers. An Avengers connoisseur!! This pleases Le Clown. All jokes aside. I’m a big fan of the show, and the exquisite character that is Ms. Peel. Agreed. I knew we shared exquisite tastes. That trip sounds amazing! I’d like to visit all of those destinations. I’ve always wanted to travel on the Orient Express or the Blue train in South Africa. That type of train travel seems so luxurious and much more civilized than air travel. The train travel is retro-civilized (I just invented that word) but the air travel to get there is modern-day ugly.